Integrate Snapchat Into Your Marketing Strategy: Just when you feel like you’re figuring it all out. Another social media marketing platform pops up. I get it, you’ve just come to grips with how to engage your audience on Facebook and Twitter – why another one? Snapchat is unlike any other social platforms, and it takes a little getting used to. But the upside is pretty impressive. Snapchat’s developers went beyond traditional rules of social media and featured the app with something other developers couldn’t fathom: time-constrained photo and video shares. How do these ephemeral shares come in handy? One would assume that it’s something only a green-teen would use for inappropriate shares. However, according to Pocket-lint news, “As many as 700 million photos and videos were shared on Snapchat per day”. And according to Statista’s Snapchat 2014 Age Distribution Chart, 31% of the users were between 18 to 24 years old and 19% were over 25. It seems like there’s more to this app than meets the eye. Should marketers ignore this app and let it be? Certainly not! You might be missing out on what is currently one of the most popular social media platforms after Facebook and Instagram. Besides there’s no harm in experimenting with “snaps”, especially if your target audience is composed of a younger demographic. Before we look at how you can integrate Snapchat into your marketing strategy, let’s examine a few case studies. If you’re a sports fan, you’ll love McDonald’s latest snappy idea of creating “snaps” of famous athletes such as LeBron and Johnny Manziel. Fans were able to view behind-the-scenes commercial footage and snaps of food and contests. Sports fans Lovin’ the snaps! Free people went one step beyond traditional marketing by giving fans and customers “sneak peeks” of new collections and engaging with them personally. According to the Free People director of marketing, Kathryn O’Connor, Snapchat provides a way to gain a follower’s full attention because of the self-destruct feature. Their unique snaps keep a follower “guessing” what’s coming next. GrubHub has truly made a splash with its unique marketing strategies, many of them which involve the use of Snapchat. Last year, Grubhub used the doodle feature to invite internees by running a Snap-Doodle contest. The best doodles snapped would win a chance to get interviewed for an internship opportunity. Grubhub continues to the use the app for all sorts of promotion strategies such as promo codes, giveaways, sneak-peeks, stories, and behind-the-scenes video footage. 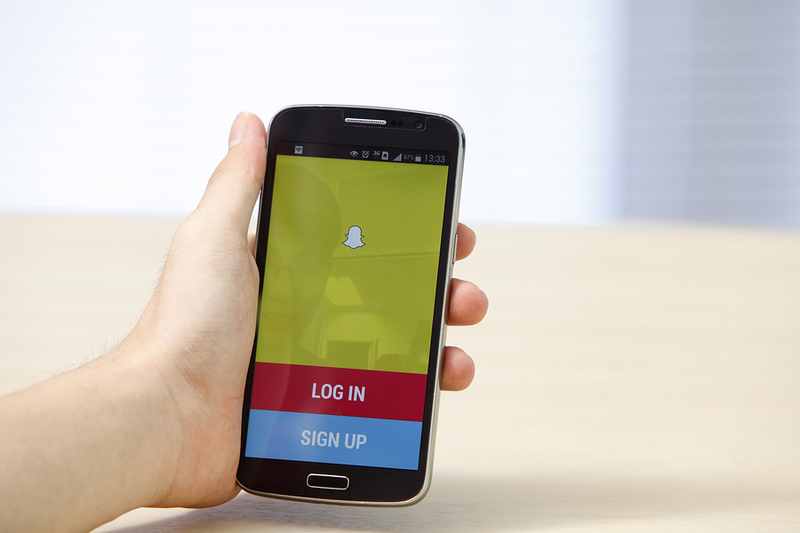 Now let’s move on to 5 ways you can integrate Snapchat into your marketing strategy. First and foremost, you need to turn the tables on traditional marketing thinking. You have got to embrace the very feature that bothers you or makes this app different. For Snapchat, that is clearly the self-destruct feature. Top marketers of well-reputed companies and those of the examples above did just that to create unique and engaging content. They thought of ways they could utilize the in-in-a-snap and out-in-a-snap feature by sharing content designed for that purpose. They captured spur-of-the-moment content that has less value as time passes by. For example, what an NBA basketball player is doing before the game is relevant at that very moment, but once the moment has passed, it become less effective. Snappy discount offers and coupon messages is one of the most popular business uses for Snapchat. Coupons and offers will most certainly have a time limit. With the self-destruct feature, you won’t have to worry about explaining why the offer has expired. Acknowledging the fact that these offers and coupons are limited, Snapchat users will have an incentive to always remain up-to-date with the company account and their offers. Send them promo codes they will have to show to redeem a coupon and get them hooked to your business offers! A popular frozen yoghurt brand, 16Handles, successfully launched the SnappyNewYear campaign where they encouraged users to snap a picture of them eating the yoghurt and receive 16% off, 50% off, and even 100% off coupons to show to the cashier in only ten seconds before it self-destructed. Once you have your fans and followers hooked, you have a chance to engage them with sneak peeks of new arrivals. Generating buzz about new collections and products is a great way to ensure the sales fly high once the product is launched. Fashion Designer Rebecca Minkoff released her Spring 2014 collection during fall 2013 to give her fans a peek at the next year’s exclusive collection even before it hit the runway. Your Snapchat followers will be rushing into your store head-first to collect the latest items before anyone else does! Inform your customers every time there is a special sale or event. Flash sales are a great way to invite masses of customers looking forward to exploit the latest sales offers. Exclusive sales and events last for only a short period of time. Last year, Snapchat rolled out an Amazon and Hollister sponsored Black Friday event ads alongside user-generated content. You can also restrict this to only the most avid fans and followers and make the event invites exclusive to your loyal customers. Invite them to a tour behind the scenes or for a taste of the latest food product. Release footage of behind-the-scenes pictures or videos and show your fans what you are all about. Behind-the-scenes photos and videos are intriguing for customers and a clever marketing tool that is never timeworn. Create targeted messages or videos for special customers who would love to “take a peek” at the production process. Several companies use this technique to allow the users to “guess” what the image/video is about and share their ideas using a Twitter hashtag. Guest Author: Rochelle Ceira loves blogging a lot and in her leisure time she dedicatedly writes insightful posts on latest trends, education, marketing. Apart from being a digital marketing manager at day time, she’s also a part-time blogger. Next articleFacebook introduces offline features and tweaks for slower internet connections.